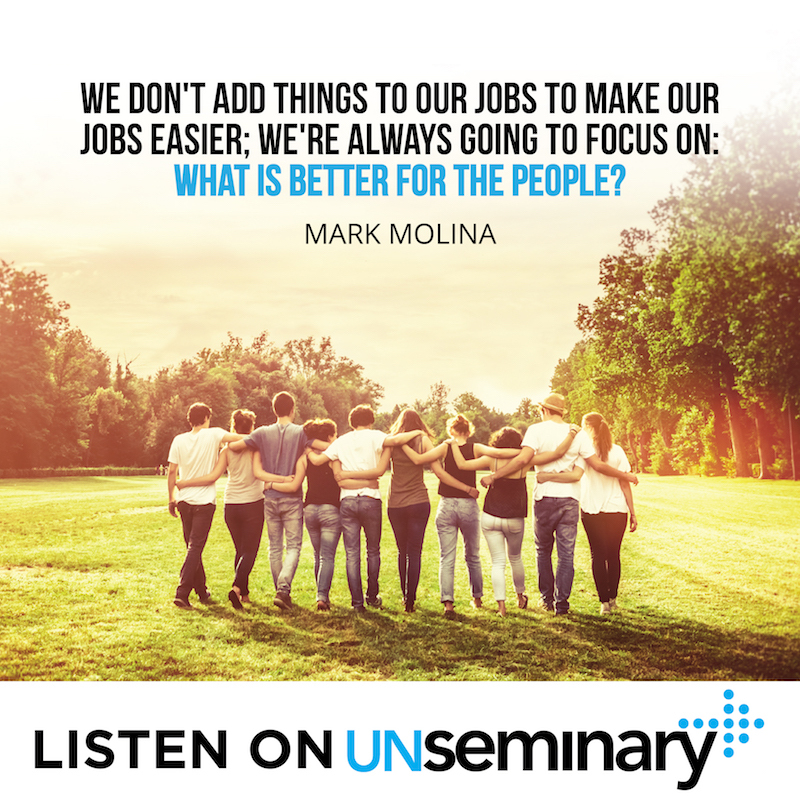 Welcome to this week’s episode of the unSeminary podcast. We’re happy to have you join us today as we talk with Mark Molina of Westover Hills Assembly of God in San Antonio, Texas. Westover Hills Assembly of God has three campuses and about 4,000 people who come to hear God’s Word. The church was started in 1986, back when, as Mark says, “the only things here were Seaworld, QVC, and our church.” But the church, like the city, grew into a multi-cultural community and will celebrate their 30th anniversary this year. Mark is the executive pastor of ministries at Westover Hills and his key role is to help advance the heart of the pastor and guide the ministry staff. Listen in as Mark talks about how to connect with people as early on as in the parking lot and guiding people to that next step in their walk with the Lord. Start the altar in the parking lot. // Capture the attention of visitors before people who come to your church even hear the message. At Westover Hills, they make sure to start on time so that no one is left waiting or held up. “The whole service is the message,” Mark says, “not just the preaching.” Westover Hills tries to create an environment that invites God to speak to the people from the first interaction. The church wants people to feel like they and their time are valued as well as invite them to have a great time during the entire service. Be defenders of culture. // The staff at Westover Hills wants people to feel the vibe of who they are as a church once they arrive. This means that the church isn’t based on any one person’s personality or mood for that day; the church remains true to its core values and culture. In order to do this, Mark and the rest of the staff make sure that anyone new who comes on board, whether they are staff or volunteers, knows who the church is and what culture it’s founded on. Developers of people versus doers of task. // Within staying true to that church culture, it’s also important to let people grow. 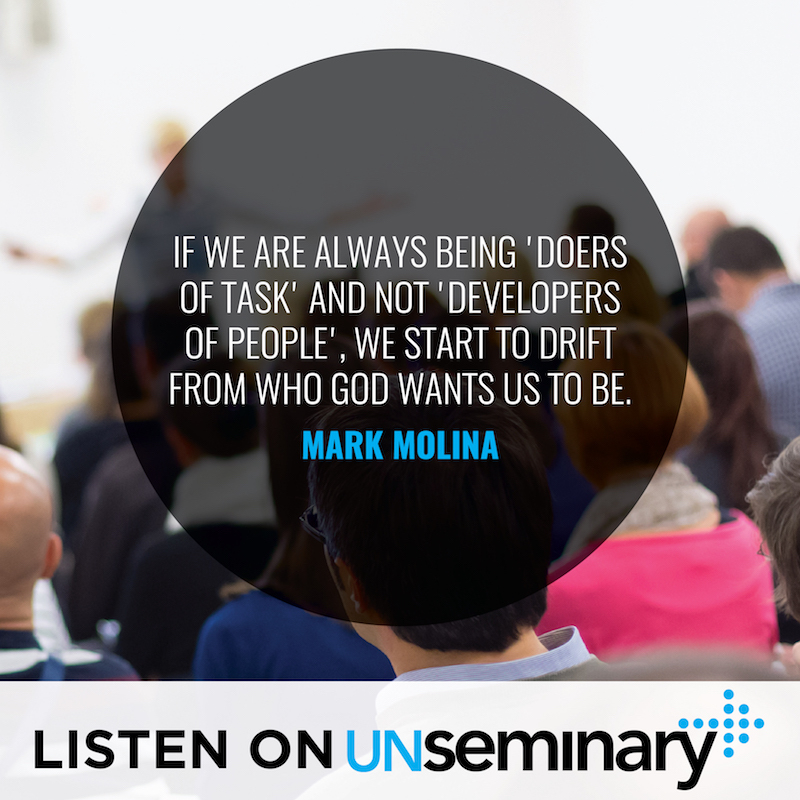 As Mark says, “If we’re always doers of task and not developers of people, we start to drift from who God wants us to be.” It’s important to focus on growing and developing the people the church is serving through discipleship opportunities or the church will lose sight of its true purpose. Guide people to the next step. // The back door issue in churches is a huge problem and it can be difficult to get people plugged in. One way Mark and his staff try to engage their visitors is by always providing the next step. “Here’s the next step for you. If you’re new to our church, here’s the next step,” Mark says. If you don’t offer that guidance on what people should do next once they arrive within the church, they could easily slip right out the back door without ever really being noticed or touched in some way. That next step for first time visitors can be as simple as filling out a visitor’s card or attending a welcome weekend service, something that will offer a way to connect with them. You can learn more about Westover Hills Assembly of God at their website westoverhills.church or you can email Mark at [email protected]. 01:24 // Rich introduces Mark Molina and welcomes him to the show. 02:00 // Mark gives us a flavor of Westover Hills Assembly of God Church. 03:48 // Mark talks about the church experience. 05:04 // Mark talks about his role within the church. 06:05 // Mark talks about how the church recognizes and shares its culture. 07:38 // Mark shares the church’s strategies for continually sharing the vision of the church. 09:19 // Mark talks about the church’s strategies in place for connecting ‘secret shoppers’. 11:04 // Mark talks about the church’s Mission Statement. 12:55 // Mark shares how they continue to grow with their culture. Rich – Well hey everybody, welcome to the unSeminary podcast. My name’s Rich, the host here and I’m just so honored that you would take some time out of your week to listen in today. We know that you’re having a busy week as we head into this weekend. You’ve got a lot going on and I’m honored that you would take some time out to spend with us today. We’ve got a fantastic guest, from a great church. I’m super pumped to have Mark Molina with us. He’s from a church, Westover Hills. Westover Hills Assembly of God Church in San Antonio, Texas. Mark welcome to the show. Mark – Thank you Rich, good to be a part of it. Rich – I’m so glad you’re here. This church has got three campuses, it’s really a thriving church, with a weekly attendance of about 4 thousand people. It was one of the fastest growing churches in 2014, I think also in 2015. Just a great church and if you’re not following them, you should get a chance to kind of get to know them a little bit better. Mark, why don’t you tell us a little bit about the church and then also your role there? Give us a sense of the flavor of the church. Mark – Okay. Yes, we’re in Northwest San Antonio. It started in ’86, so we were out here when there was really… the only thing that was out here was SeaWorld, QVC and our church. Rich – That’s good neighbors. Mark – Absolutely. So we have a long history in this area, just celebrated 30 years, 30 years will be this coming year. So our church is a very multi-cultural church. We kind of like to say we’re color blind. Mark – That’s just kind of the heart of our Pastor and really that bleeds down to our staff. So we love to express our worship. We love to just make the Bible in the weekend so relevant. We’re very next gen, just for kids, for students, we’re very driven for the next generation. So we’ve got a great church, in a great city. San Antonio’s been known as Military City because of all of the Bases. Mark – So we have a lot of people that come in and we get so we’re constantly meeting people from all over, because a lot of them live in this area. This whole region of San Antonio, the zip code has grown quite a bit. So all I have to say is, our church is very multi-cultural and yes, so that’s a little bit of who Westover Hills is. Rich – Yes. If people were to come on a weekend, what would the experience of the ministry, not just weekends, because I know you do mid-week services, give us a sense of what that experience would be like. Mark – Well obviously, like any church, we want them to have a great first impression. We believe that the alter starts in the parking lot. So we’re really wanting to, before they hear the message, that they’re already starting to get captivated. So we always start on time. We value people’s time. Mark – We kind of create that hour and 20 minutes, we say that the message is not the, how can I phrase this? The whole service is the message, not just the preaching. Mark – So we really feel like, when people come in, from the countdown to the first strike of the drum, the first note, we want God to begin to speak to people and not just people wait for the Pastor to preach or whoever’s speaking. So we feel like they’re going to get just a great time of worship, it’s a time of celebration. We don’t spend a lot of time on announcements and then hopefully they don’t just get challenged but they lead change after the service. Rich – Very cool. Now tell us about your role there at the church. Mark – My role is Executive Pastor of Ministry. That’s my title, but my key role is to just help advance the heart of our Pastor. Now there is a job description, but that is kind of a big part of what I need to do, help do and kind of carry his heart to the staff. I oversee the ministry staff, you know of course that’s children, youth, music, care, seniors, admissions, all of those things. I kind of help guide that and run the staff in that regard. Rich – A church of your size, there is a unique kind of culture that rotates around it. You have to continue to reinforce the things that you see as valuable and trim off that stuff where you’re like, “That’s not quite us.” I wonder if we could talk through that a little bit. Rich – How is it that you’re able to shape culture at Westover Hills? Mark – Well you know, when all the Pastors are together in one room, we are defenders of culture, we are implementers of culture. We look at it from the top down, from our Pastor to our staff, we’ve got to deep seed that. We actually recognize its culture as an extra staff member because when people come in we want them to feel the vibe of who we are. We often say we’re not personality driven, you know, what you see is what you get. We’re going to stay consistent to who God has called us to be. We absolutely love what different churches are doing in our area. We have some phenomenal churches and we often say, “Hey, we’d love you to be a part of our church, but if not there are great churches in our area,” but we stay close to who we are, who God has called us to be. So we try to deep seed our culture in our staff and then we’ve got to take it and champion that through our volunteers to make sure that they’re hearing who we are and what we’re about. Rich – What would you say would be some of those, maybe guiderails, of your culture? Things where you’re like, “Ah, I feel like we’re pushing outside of the kind of church God’s called us to be. We’re becoming too much like someone else.” What would be some of those things that have popped up that you’ve tried to move back towards and how have you done that? How have you identified them and then how have you found the problems and then also tried to guide them back towards, closer to the culture you’re trying to create? Mark – Absolutely and I think one of the things we kind of notice, if we are always being doers of task and not developers of people, we start to kind of drift from who God wants us to be and when we’re struggling with that, we feel like we’re trying to carry too much and we’re not being able to let people grow in our church and help us carry the vision. So when that happens, when we see whatever it could be… Right now, on a roster of volunteers across the board, we probably have anywhere from 950 to 1000 people, whether it’s kids, youth, children, music that are volunteering. When we see that decline, when we don’t see the heart being extended through volunteers and people have caught our vision, that begins to tilt us, it begins to drift and we’ve got to kind of bring it back. That’s just one area, one example that we try to keep our fasteners on. Rich – Yeah, kind of changing direction a little bit, just talking about something different. Obviously a church like yours is growing and there are a lot of people coming in through the front door. How do you guys think about the backdoor problem, or the backdoor issue as a church? Mark – Yeah, well it is. I think we have your everyday visitor who may be a seasoned church person, they’ve just moved to the area, but then we will always have those secret shoppers. They are not going to fill out a card. Mark – They are not going to raise their hand. So that is an area where, I think we have always had to work through in regards to simulation. We try to make sure that every weekend we are providing people with what we would call, in our language, a next step. “Here’s a next step for you. If you’re new to our church, here’s a next step for you,” because if we don’t put that in front of people all the time, again a lot of those secret shoppers are going to go out of the backdoor and they will never be on our radar. If they don’t fill out a card, they don’t attend like a Welcome Weekend, something of that regard, they may not show up on our database until they give something. Mark – By that time it could be very easily be seven, eight months down the road and they have not connected anywhere and we thought we were going to keep them. So again, our next steps are critical to helping move along and make sure they don’t get to that backdoor. Rich – What would be some of those next steps, the kind of things that you’re encouraging people to..? That’s a critical lesson, I hope for church leaders that are listening in, that providing clear, really relevant, you know, this is what we’re asking people to do, is super important. What are some of those things that you’re asking people to do, some of the next steps you’re asking people to take in your church? Mark – Well we kind of go with the approach of Andy Stanley: Obvious and Strategic. Mark – Something very easy for them to do. On the practical side we do have, every month, a Welcome Weekend. Every month, every service we have a place where people can stop by and get connected and find out a next step. Our mission statement is Making New, Making Great. We have a Making New class for people who are just brand new in the Lord, or they’re kind of still in that secret, you know, we invite them to be a part of that. We publically announce, “Hey, if you’re new to Christ and you’re just wanting to find out, ‘I know I’m supposed to pray but I’m not sure how to do that’,” Making New class is what you need to be a part of. So it’s just consistently getting them to a growth pathway. Our strategy is connecting, growing and serving. So we feel like the connecting is, we do a good job at that, we could always do better, but the growing, there are multiple pathways that they can do. Again it could be small group, involved in ministry, taking some type of a class that we may have, all the way from your traditional Bible Study to doing Zumba. Just whatever it takes to get them connected with people, we feel a big church gets small real quick. Rich – Absolutely. Now we were offloading a little bit into the connection stuff. I appreciate that. Back on the culture question, when you interact with your team, the people who report to you and that group of people, what are some of the ways that you’re reinforcing and ensuring that the culture is heading in the right direction? Mark – Well we begin every meeting with, on our agenda, there’s blank statements there, they fill it in. What are we about? Making You, Making Great. Rich – A call from somebody, that’s great. Mark – Sorry about that. Rich – No totally fine, not a problem at all. So you were saying on every agenda there’s a blank. Mark – So on every agenda we’re going to put our Mission Statement, we’re going to have them fill out our core values. In fact, we’ll call on a staff member to recite the core values, to recite them. So we just keep that foundation in front of them. Then we talk about, “Let’s celebrate. What is happening and Making You and Making Great in your ministries?” We’ll just take a couple of minutes and just always have a ‘control alt delete’ moment at the very beginning, why we do what we do. We also implement [Inaudible 00:13:55]. We don’t do things in our job or add things to our jobs to make our jobs easier. We’re always going to focus on what is better for the people. What is better for the people? Is this better for the people? Then that’s what we’re going to do. So it’s just kind of keeping our focus, not on the program but people, just keeping their hearts in front of us. Rich – Very cool, very cool. Well this has been great so far. Anything else you want to share, kind of about culture, keeping culture pushing in the right direct, before we move on with the rest of our interview?